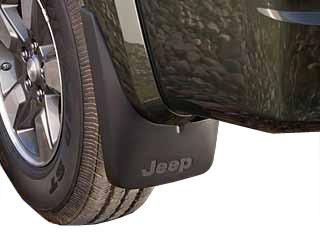 Protect your 2008-2012 KK Jeep Liberty from salt and sand on the road as best as possible with the Deluxe Molded Splash guards. Crafted out of TPO plastic and TBR runners, the Deluxe molded Splash Guards are crafted for ultimate durability and fit. These materials allow the Guards to follow along with the curves of your Liberty. Another great feature of the Splash Guards is that they are paintable. That's right, not only do you get maximum protection for the under body of your Jeep, but you can make it flow flawlessly with the rest of your Liberty. Start protecting your Liberty with the Deluxe Molded Splash Guards today! The front set does not come with Jeep logo. I ordered these rear splash guards to help keep crud from flying up on the lower rear fenders. They look great and harmonize with the rest of the vehicle.